On Monday, June 18 at 9:30am, we were admitted to Labor & Delivery after a whirlwind of events from the week prior. The nurse escorted us down the hall to room 341 and asked me to get into the gown, get settled and that another nurse would be in shortly to do our admissions paperwork, start an IV and check to see how I am progressing. Chris and I decide that it is probably smart for him to rush home, repack my bag and come back to the hospital with all of the supplies that we will need for the next few days. He leaves and I sit in the bed thinking about everything to come and soaking it all in. Our nurse, who was actually a midwife was phenominal. She remembered hearing my story from the previous week and was very caring and reassuring that all would be perfect. My doctor came back at 10:30am and broke my water. No meconium or issues that he could see, but he did say that I had a tremendous amount of amniotic fluid, which probably came in handy when I fell. Around 11:30am, he began the pitocin drip and emphasized to the nurse that I went quickly last time and that he expected the same this time. He also asked to be alerted to any changes with my progression and that I could have my epidural whenever I felt that I needed it. Around this time, I was contracting about every 3-4 minutes and the contractions were increasing in their intensity. Chris came back to the hospital around 11:45am and was shocked to hear that I was at 4cm and 90% effaced and progressing very quickly. My nurse asked me in between contractions that I had been breathing through if I wanted my epidural. I said that I was still doing well with breathing and that I was hesitant because of possibly stalling labor so early in the process. She reassured me that it would be fine and that she would call the anesthesiologist to come in and get me set up. The anesthesiologist was wonderful! She was calm, caring, funny and sweet and I am so thrilled that I was able to have her. Unlike my previous delivery where Chris was my support while getting my epidural with Jack, they had Chris exit the room and the nurse midwife was my support while they hooked up my epidural. Once I was comfortable, I laid back and waited for labor to continue to progress. About 15 minutes go by, and some alarms begin going off. The baby’s heart rate was dropping. Hy heart was in my throat as my thoughts traveled to an unforeseen issue with the baby from the fall. The nurses turned me on my side and his heart rate came back up. Thank God. The deceleration of his heart rate happened every so often after that, but was always remediated when I moved a different way. Around 3pm, the nurse checked me and said that I was about 8cm dilated and that it shouldn’t be long now. The nurses also changed shifts at 3pm, so my wonderful nurse midwife left and another great nurse came in. My doctor called for an update and announced that he would be back around 4pm to check me again. As I had transitioned quickly in my last labor, I knew that I would never make it to 4pm. Coincidentally, I began feeling every contraction, pain- just everything and was practically climbing the walls in pain. It was almost as if the epidural just completely stopped working. The nurse saw the amount of pain that I was in as I clutched the rails on the side of the bed, breathed and let the tears continually run down my cheeks. Word could not escape my mouth and I felt as if the baby was going to come at any minute. Our nurse called the anesthesiologist, who was also new due to the shift change and was beside himself when he saw the pain that I was in. He nervously poked me with a sharp popsicle stick and continued to try and ask me questions as I breathed heavily and continued to let the tears fall. He said that he would give me a bola (sp?) to help with the additional pain that I was in. Chris was smart and said to the nurse that she may want to check me again as this was similar to my previous labor. She checked me and immediately called my doctor to come and deliver. When my doctor arrived a few minutes later, he said that he wanted to see how I had progressed and when he looked, he asked me to wait so that he could put on his coat for delivery. He announced that he could already see the baby’s head and that this was going to be quick. Other nurses and the pediatrician flooded the room and he said to start pushing. With only two pushes, our sweet and beautiful baby boy was here! 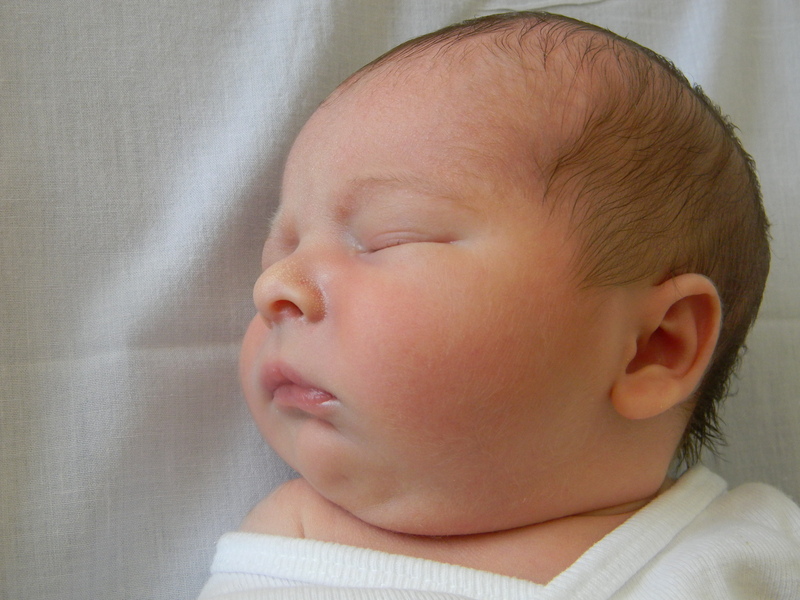 Max Russell came into the world on Monday, June 18 at 3:50pm. 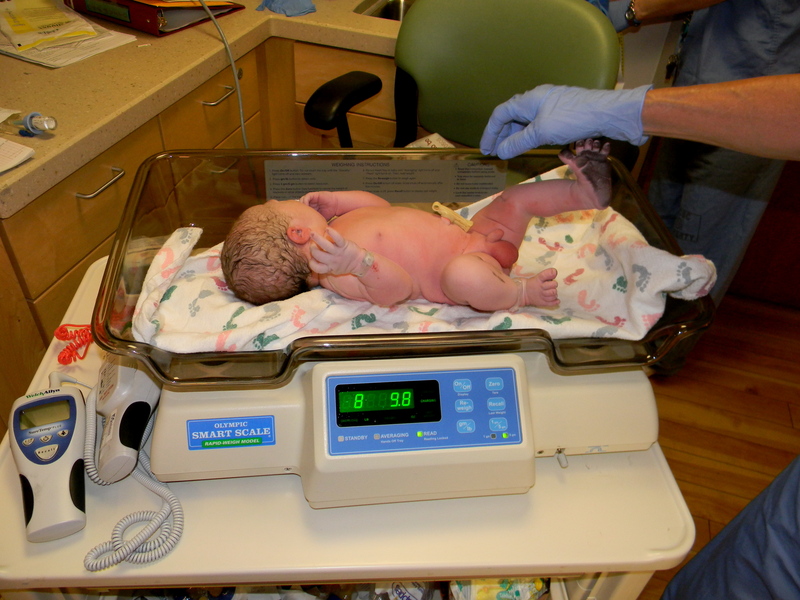 He was 8lbs, 9oz and healthy as could be. He received 9’s on his APGARS and was absolutely perfect! I felt my mother in the room the moment he was born. She was there watching over all of us and ensuring that this wonderful and beautiful boy was safe. Max was cleaned up a bit and handed over to me where he almost immediately wanted to nurse. We bonded as Chris and I soaked up every minute of our secind son’s first hour of life as he nursed and cuddled us in the hospital. The day began as normal as any other and although I was tired enough to nap for 5 hours straight, I got up early and got to work as I knew my in-laws would be arriving the following day. Cut to me arriving at Jack’s school around 3pm to pick him up and bring him to the park. After speaking with the school director for a bit and joking that this is the everlasting pregnancy, we agreed that the weekend was a perfect time to have the baby. Jack’s teacher applied more sunscreen to him so that we could be prepared for the hot sun at the park and off we went. Walking outside of the school door, Jack walked over to the car and as I was walking with him, I tripped over the sidewalk and fell flat on my belly. Immediately my eyes filled with tears as my worst nightmare was seemingly a reality. My mind raced as I thought about whether or not my water broke, whether or not the baby survived the fall and where Jack was in a busy school parking lot. I was sobbing and yelling for help. Jack came to my rescue and so did two very nice landscapers who just so happened to be planting some shrubs in front of the school. Jack began crying and I could see that he was terrified to see that his Mommy fell and was crying too. One of the teachers came running outside to retrieve Jack so as not to scare him and another landscaper called 911 and my husband for me. Chris showed up on the scene before the ambulance even arrived. Calm as anything, he held my hand and assured me that the almost 40 weeks gestation baby was going to be fine. God, I love that man. I remember poking my belly praying for the little one inside to poke back, move or show some sign that he was alright. Cue the ambulance. This was my first time riding in an ambulance and as terrified as I was, all I remember is Chris following us by car, praying my head off that everything would be ok and for us to arrive at the hospital ASAP. It was the absolute longest 10 minutes of my entire life. My eyes were focused on Chris driving behind us to gauge his reaction to the situation. There was a time when he looked a bit worried and I felt it. 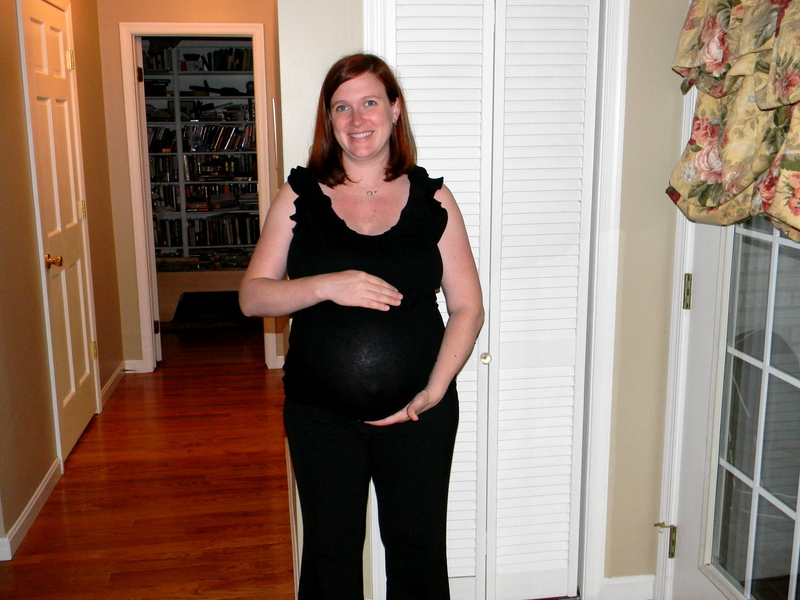 Almost simultaneously, I began feeling strong contractions that were a few minutes apart. As the ambulance pulls up to the Emergency bay of the hospital, I feel the baby move a little bit. My glimmer of hope is strong that this baby will be alright. They rush me into the trauma unit as a level 2 trauma. Literally, 20 people come rushing at me hooking me up to monitors, taking off my clothes, asking me questions and taking about 8 vials of blood while calling the hospital for an ultrasound machine and an ultrasound tech. This experience was terrifying and I begged for them to let Chris come back with me. The doctors explained that the policy doesn’t allow anyone back there, but he would see what he could do. Meanwhile, Chris parked the car and was escorted into a private room away from the waiting area where he waited for any sort of news. Finally, the doctor allowed Chris into the trauma unit and the ultrasound tech was doing an ultrasound to look for bleeding and to see if the baby was doing ok. She checked around for about a half hour and the monitors were showing that my contractions were getting stronger and closer together, so off to Labor and Delivery I went. My doctor met me in my room when I arrived by wheelchair and tried to cut the tension by saying “What the heck happened, klutz! ?” I explained the story and he said that they would be keeping me at least until 9pm as they performed more tests and monitored my contractions. My stay became an overnight stay for more monitoring and more tests as they found that some of the baby’s blood had mixed with my blood due to the blunt force of the fall. Immediately, my doctor is trying to rule out placental abruption, which could be fatal to the baby and cause many other complications. I swear that my parents and God were looking out for me because even though I was still very worried about losing the baby, I felt a comfort and a nonverbal reassurance that all would be ok. They kept me until late Saturday where they were able to rule out placental abruption. So, after 18 needle picks, IV’s, countless ultrasounds and pages of contractions and fetal heart monitoring, the doctor was convinced that the baby was fine and that I was fine. So, in the meantime, why not break my water, start pitocin or just send me to the OR suite to have a c-section? The doctor said that breaking my water and starting pitocin, especially if there was a placental abruption, would cause much more harm than good. 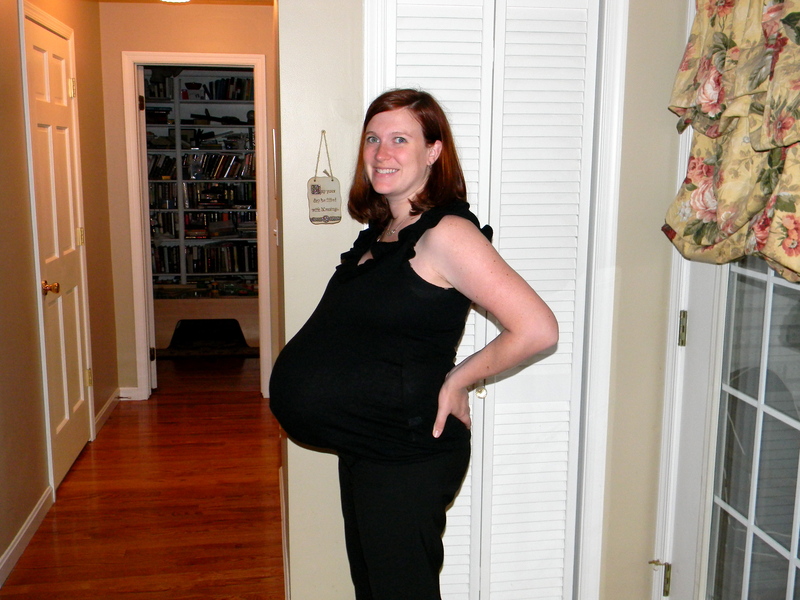 So, my contractions continued, would strengthen and then often dissipate. 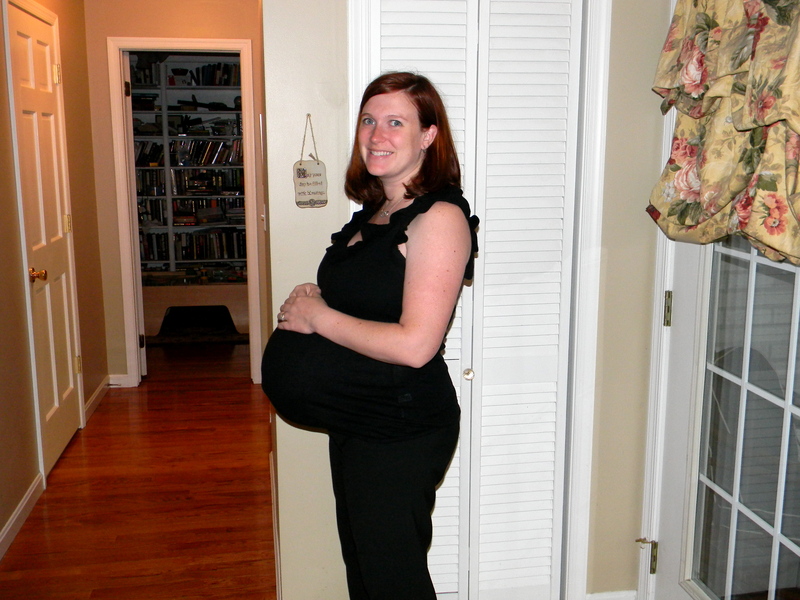 Often, the contractions would be pretty strong and about 3-4 minutes apart. Why not a c-section? The doctor did say that we could head down the hall and get it all over with, but he was almost certain that all would be alright and that I would be able to deliver vaginally when the baby was ready. After I left, I came home, spent some time with my family and was told that I was on cervical rest and that I would need to return to the L&D unit the following morning for another non-stress test. Sunday morning, Father’s Day, I went in at 7:30am for my NST, which showed that I was still having contractions, but there was no change. Monday morning, my doctor asked me to come in for an ultrasound, another NST and to be checked. The NST showed that I was having strong contractions that were 5 minutes apart (I didn’t need the machine to tell me this- I felt every last one!). The ultrasound showed that the baby was about 9lbs, 1oz and was healthy as could be. Thank God! Chris and I walked into the unit, announced that we were in labor and that my doctor had sent us. 39 Weeks, 4 days- Belly Post!! So, the all-important appointment with the OBGYN on Monday morning was somewhat of a bust. I was an idiot and thought that the appointment was an hour earlier, and was hurried in by the nurse with Jack and Chris in tow as the Saab was still in the shop getting fixed. Blood pressure? Great! It was something low, as it usually is. Weight? I’m only up 12lbs for the entire pregnancy, but still down from what my pre-pregnancy weight was. Baby’s heartbeat? Excellent and strong. Belly measurement? Still measuring big, but healthy. Many more stretchmarks this time around. Everything is perfect!!!! Enter my doctor, who is quick to check me- and immediately, there is a page over the intercom: “Doc, Labor and Delivery- NOW!” He apologizes, asks me to wait for him to return so we can talk and exits. I’m thinking that he wants to talk to me about coming back to the hospital that night for an induction, etc… So, Chris, Jack and I park it in the waiting room waiting for him to return for our talk. About 15-20 minutes goes by and my doc comes back. He calls for us to come back to talk and tells me that there are no changes from last week, but if there were, he would have sent me right to L&D. Cue the urge to have a huge sobfest in the middle of the office. So, after bribing him, (yes, I have no shame) he agreed to see me again on Thursday, and if there was more change, he would send me right to L&D. If not, I would have an appointment on Monday, a day after my due date. I begged him to reconsider and just send me now to L&D, and he said, “Don’t talk to me, talk to your cervix.” My response? “You need to talk to my cervix and get it to cooperate! !” He laughed and said to try the wives tales before the appointment on Thursday. So, to be honest, I was disappointed, especially since I thought that Friday night was THE night, and that all of those contractions would have done something, but oh well. In the meantime, we have been walking a lot and trying to rev up contractions or at least dilation and effacement as best as we can. Any suggestions are absolutely welcome. To be honest, I truly felt as if last week would have been my last weekly pregnancy posting, but alas, this little one is still cooking away! This week has been even more difficult since we are down a car (Saab is back in the shop again), Jack has decided that now is the perfect time to begin his rebellion stage, my in-laws arrive on the 15th so Operation Prep-for-tons-of-visitors-Cleanathon has commenced, not to mention that I constantly feel as if I could fall asleep any minute. Still working 40+ hours a week is absolutely brutal, and by the time I walk in the door at 6pm, I could practically fall over dead. Chris has been a tremendous help with everything. He has been the one cleaning up after dinner, giving Jack a bath and assisting me with tidying up the house at the end of the day. Lucky doesn’t even come close to describing how I feel about him right now. I am beginning to feel a bit guilty that Jack will probably be blindsided by this new little baby in the house, although we have been trying to prep him for several months. He will tell people that he is going to be a big brother, but when it comes down to it, he doesn’t really understand that the baby is coming and once he is here, he is here to stay. His whole life he has been an “only child” and has been the absolute center of our worlds, and now all of that will begin to change. The past several weeks have been very focused on Jack and toddler friendly activities as our social life will not be as busy in the near future. We are sure that Jack will love his brother, but we are preparing for a time of adjustment. Maternity clothes? Anything that fits! Sleep: Terrible. Exhausted, trying to sleep, constantly waking up…just a mess. Best moment this week: Having true timeable contractions- to the point that I thought it was time to go to the hospital! Food cravings: Not much. My appetite has pretty much left the building. Anything making you queasy or sick: No. Have you started to show yet: This question gets on my nerves. Happy or Moody most of the time: Happy but very tired. Looking forward to: My appointment on Monday and to hopefully have a definitive date for this baby’s arrival. After a great appointment with the doctor on Monday (I got myself crazy over nothing), we are ready to finally meet this baby! Baby G2’s heartbeat is strong and although his movement has slowed and is not as dramatic, he is still growing and seems to be happy in there, for now. My OBGYN checked me also on Monday, and I am currently 2cm dilated, +1 station and 50% effaced. So, what does this all mean? The doctor said the baby can come any time he decides to make his appearance. It could be tonight, tomorrow, next week, etc… He did also mention that the baby is already measuring big (44cm belly measurement) and he wouldn’t want him to grow much larger than Jack to ensure that he could be born vaginally. I personally wouldn’t care for that either. So, we scheduled another appointment for next Monday morning, and my hope is that the doctor just tells me that we will schedule an induction, if I don’t go naturally before then. The contractions are still strong and are mostly timeable, but they seem to go away after a while, but the pain is pretty good with these. The other concern is that Jack came pretty quickly and that I would probably go quicker this time than I did with him. Labor with Jack was from 9:00am when they broke my water and started the pitocin and Jack was born at 3:50pm that afternoon! Quick for a first delivery! 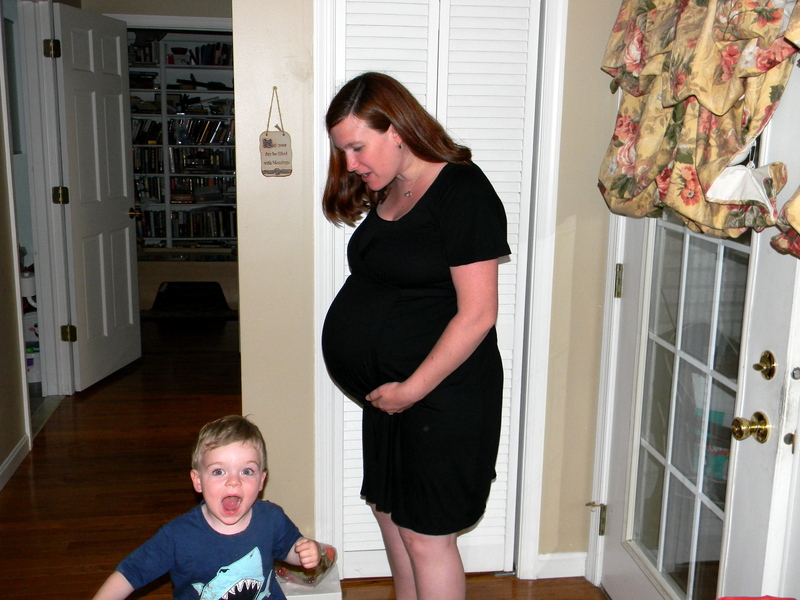 My heartburn has kicked back up a notch recently, which is funny as the baby is descending and not ascending. Even Gatorade gave me a terrible case of heartburn the other night! Tired all of the time- exhausted explains this well! A few friends keep recommending that we begin with the Old Wives Tales to get labor revved up, but so far, we haven’t done anything to try and get labor started. So, what are your thoughts? Should we host a little baby pool on the old blog and see who is right? I will say that it would be pretty cool to have the baby next Wednesday (June 13) as it will be my 30th birthday and my sister Lisa’s 44th birthday! 38 Weeks- Hanging in There! This was a whirlwind week to say the least. I went to my weekly appointment, as I do every Wednesday, however the doctor was on vacation this week. No big deal. I had an ultrasound to see how big the baby was, and he is measuring a bit bigger at 7lbs, 3 oz. They said that he seems to be very healthy and has a strong heartbeat. Chris and Jack came to the ultrasound so they both got to see the little one moving around and making faces at us. So cute! His heart rate was 133bpm and is still head down and ready to go. Things began to change following the ultrasound. The nurse asked me the usual questions and I mentioned the decreased movement (just not as often as before, I feel) and she immediately whisked me away to have a non-stress test done. 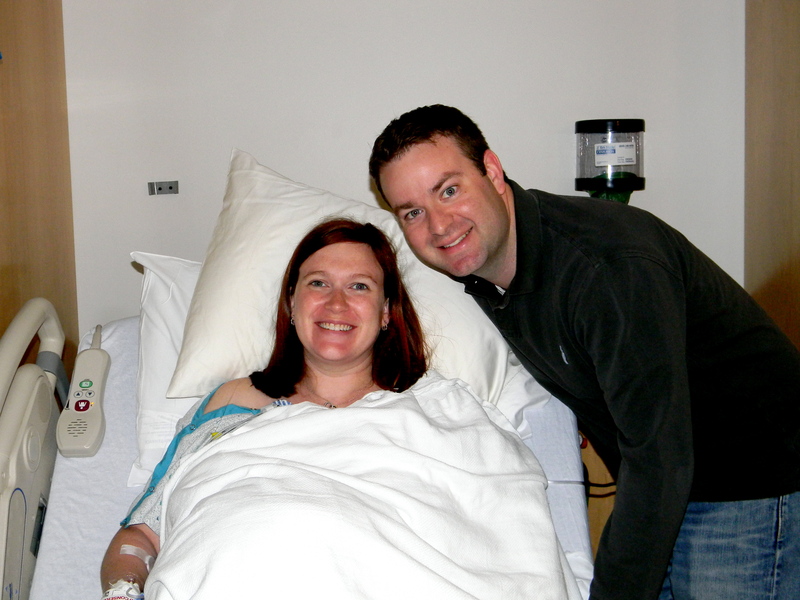 During the test, I had a few contractions and everything seemed to be fine with the baby dealing with the contractions. However, he really never moved, so the nurse held this buzzer thing to my belly to get the baby to start moving around. That buzzer sure woke him up and got him moving a bit, but within a minute or so, he had calmed back down again and was falling asleep. We tried everything to keep him active and moving, but he was just lazy. The nurse said that everything seemed to be ok and that we shouldn’t be worried. They unhooked me and brought me back to the room where another person came in and said that the doctor asked them to specifically not check me this week and that he would see everything when he came back the following week. No worries and Chris and I made an appointment for the following Wednesday and were on our way. Could it possibly be to schedule an induction? Is there something wrong? My mind is going a million miles a minute. Sleep: Not fabulous. Getting up multiple times a night to pee doesn’t help. Best moment this week: Seeing him on the ultrasound with his big cheeks and cute little face! Miss Anything? Being able to make plans and plan for things, but everything is just too up in the air right now. Movement: Not as much, but still moving around in there. Food cravings: Ice cream cake! Have you started to show yet: Still about ready to pop! Labor Signs: Definitely experiencing the symptoms, so we will see what happens. Happy or Moody most of the time: Still very happy, but missing my Mom. Looking forward to: My appointment with the OBGYN tomorrow and to see what the “method to his madness” really is. 37 Weeks- Considered to be Full Term! This past week, the doctor began checking me to see how I am progressing. My belly is measuring big, and his comment was “Wow! This baby’s big!” Not really something you want to hear right before you go into labor. He said that even though I am having contractions, lower back pain, pelvic pressure and often times timeable contractions, he didn’t think that we would have this baby for another couple of weeks. 😦 He did say that I was at a +1 station, so that is positive. Hopefully this week will bring more changes. Due to the estimated size of the baby, my OBGYN feels that it would be good to have another ultrasound this week to see about how big the baby is. I told him that I was concerned with the size of the baby and if all possible, would prefer to have the baby sooner rather than later to avoid additional complications. He smiled, mentioned that there is always an escape hatch if the baby was too big and told me that we will know more next week. 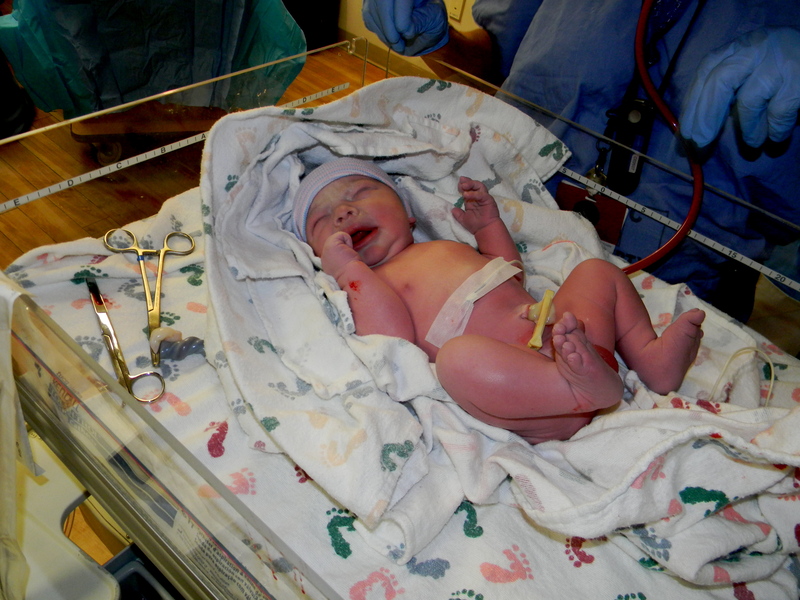 I really want to avoid a C-section at all costs, especially since I had such a wonderful delivery with Jack. I guess we will know more this week. Estimated size of you: Honeydew? Maternity clothes? Yes. Anything that fits at this time. No issues with the pants this time around, but the shirts are not covering all the way. Sleep: Getting to be less and less. More bathroom trips and just waking up with a million thoughts on my mind. Best moment this week: Considered as full-term and hoping that labor kicks in soon! Miss Anything? My mind! Baby brain is in full force and I’m finding it difficult to remember the simplest of things. Movement: Movements are not as dramatic, but some of the punches and jabs are pretty good! Have you started to show yet: About ready to pop! Labor Signs: Some of the big contractions are continuing. Some are the kind that stop me in my tracks. 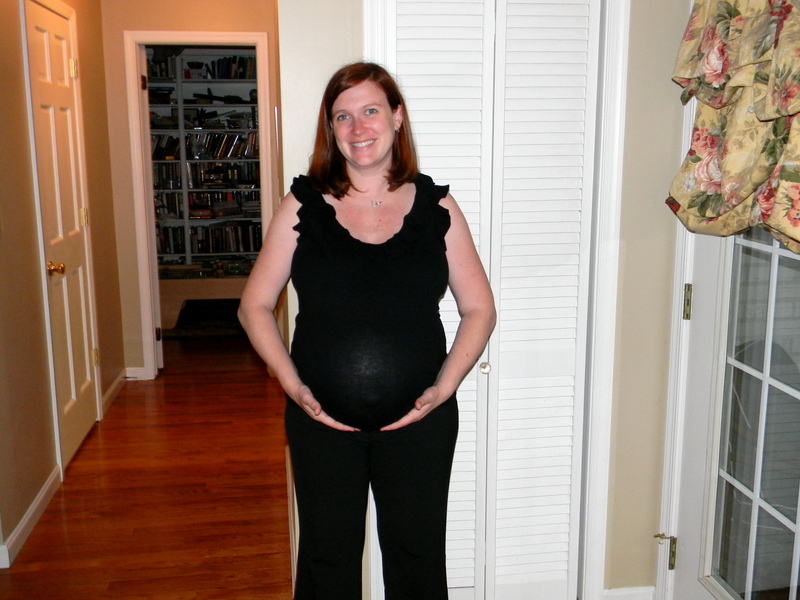 Lower pelvic pressure, lower abdominal cramping, and the contractions are getting longer. Looking forward to: Seeing what the doctor’s office has to say this week. Maternity clothes? Heading down the path of just wanting to wear dresses as they will continue to cover my belly. Sleep: Not great. Several wakeups to use the facilities, not usually sleeping in past 6am (even on weekends). Best moment this week: Knowing that the baby is considered to be full time and if he decides to come now, we are ready and he will be ready too! Miss Anything? My mother, especially now that the time is coming for this little one to enter the world. 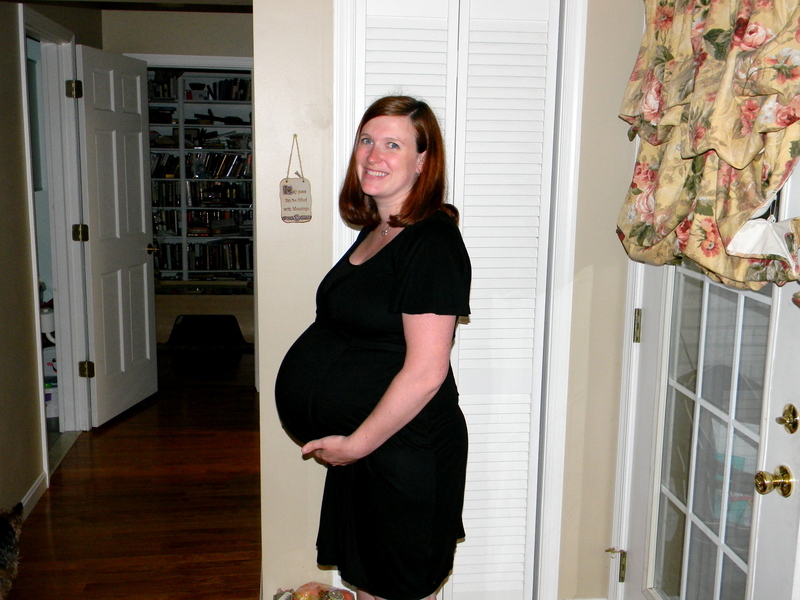 She was such a wonderful support and loved every minute when Jack’s impending arrival was around the corner. Movement: Still moving a bit, but not as much as before. Food cravings: Cake! Whether it be ice cream or regular, I must have it! Labor Signs: Some of the big contractions are continuing. Some are the kind that stop me in my tracks. Looking forward to: Meeting this baby! Keeping busy and trying to keep the momentum up to make sure that we are ready. Jack has had a double ear infection, sore throat and a cold since the week before and one day home from school, some antibiotics, he began to feel better. And for the first time in his little young life, he didn’t get a good report at school. Acting out, throwing blocks, refusing to nap and just miserable. One day, he was described as a menace. Chris and I can not seem to figure out what seems to be getting him so upset and cranky. My top guess is that his top 2 year molars are coming in, as the bottom molars are in, but I just can’t be sure. I am missing my usual sweet, even-tempered boy. Something has me wondering if he can feel the impending changes in the house. We talk about the baby coming home soon and read books about becoming a big brother, but maybe he is acting out for attention? I can see if it was just for Chris and I, but at school too? Any advice or ideas are welcome. Maternity clothes? Just ordered some new stuff to cover my belly from Gap Maternity, so hopefully I won’t be showing the bottom part of my belly to everyone. Stretch marks? Yep, the first one decided to pop out this week. Sleep: Not great. Early wakeups all week (5:30am) and having a lot of trouble getting comfortable. Best moment this week: Installing the infant seat bases in the cars and looking behind me and seeing that we now have 2 carseats in the back! Miss Anything? I miss sleeping like I used to, but I better get over that thought for a while! Movement: He is still moving, just not at much and when he does, the movement seems to be more dramatic. Labor Signs: More contractions, especially the more often that I walk. Weekly appointments start next week! Happy or Moody most of the time: Happy, but tired.